Dear friends, RRI invites you to participate in a new prize winning contest, entitled “Maramures – culture and traditions at the heart of Europe”, devoted to the northern county of Maramures, one of the most beautiful and most visited regions in Romania. Dear friends, RRI invites you to participate in a new prize winning contest, entitled "Maramures - culture and traditions at the heart of Europe", devoted to the northern county of Maramures, one of the most beautiful and most visited regions in Romania. Located at the geographic center of Europe, Maramures has always been a fascinating area due to its beautiful landscapes and the hospitality of its inhabitants. Maramures boasts numerous cultural and historical attractions and also lovely places for walks and adventure tourism. 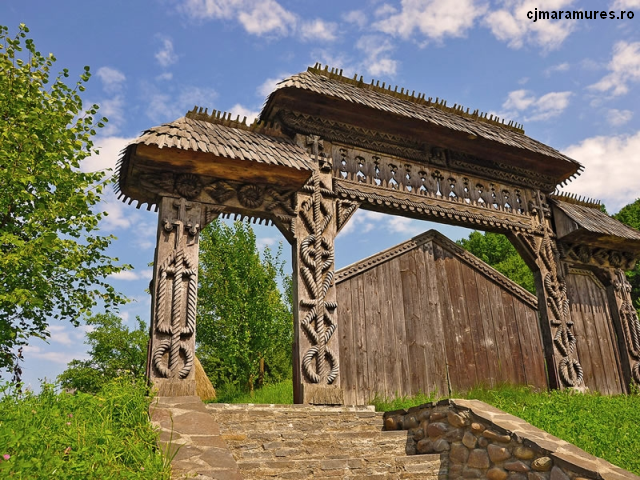 The eight wooden churches of Maramures included on the UNESCO heritage list, the Rodna Mountains National Park and Biosphere Reserve, the Merry Cemetery in Sapanta and the Mocanita steam train on the Vaser Valley are as many reasons to visit the area. The construction of the 60 km long forestry railway on the Vaser Valley started in 1930. A segment of it is now part of a tourist route. The Merry Cemetery in Sapanta dates back to the mid-1930 and is the work of the folk artist Stan Ioan Patras. Each cross is painted in blue, the now famous Sapanta blue, with a short epitaph poem written in first person. All poems start with the names of the deceased, a short description of their life and the circumstances of their death and are often written in a satirical manner. Foreigners are fascinated with the beauty of the places and the hospitality of the inhabitants, who have preserved traditions unaltered. No wonder Prince Charles of Britain himself owns a few properties in the area, in the village of Breb. Whether they choose to visit the county capital Baia Mare with its emblematic Stephen’s Tower, or Sighetu Marmatiei, the birthplace of the Nobel prize winenr Elie Wiesel, tourists are thrilled with this area. We invite you to follow RRI’s broadcasts, our site www.rri.ro and our Facebook, Twitter, Google+ and LinkedIn profiles and give correct answers, in writing, to the contest questions. The contest ends on November 30, 2017, mailing date (November 30, at midnight, Romania’s time, for the online participants). The winners will receive prizes consisting in objects that promote the culture of Maramures. The contest is organised jointly with Maramures County Council, the Baia Mare Town Hall, the County Museum of Arts “Baia Mare Artistic Centre”, the Baia Mare Branch of the Visual Artists’ Union and the Romanian Orthodox Diocese of Maramures and Satmar. - Which part of Romania is Maramures located in? - What is the name of the famous funerary art monument, one of the area’s main attractions? - How many wooden churches in Maramures are on the UNESCO heritage list? - What is the name of the county’s capital? Please tell us what prompted you to participate in the contest and why you listen to RRI’s broadcasts and follow RRI’s content online. Our address is: Radio Romania International, 60-64 G-ral Berthelot Street, District 1, Bucharest, PO Box 111, zip code 010165, fax 00.40.21.319.05.62, e-mail: engl@rri.ro. Please send your answers by November 30, 2017, mailing date ( by November 30, at 24.00 Romania’s time for the online participants). You can find the contest regulations on our website and on Facebook. Good luck!